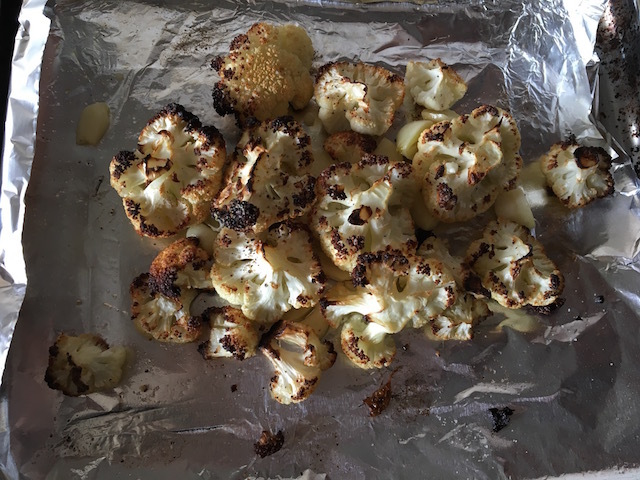 Roasted Cauliflower … Yes AGAIN! The answer, in short, is no. I will never have enough ways to prepare cauliflower. I love the recipes already posted as well as just plain old oven blasted cauliflower, but I kicked it up a notch this summer while in Central America. This recipe has what I need in super hot weather: salt from capers, tang from lime, and a good mouth feel. Something to keep on hand for when the sun comes out again, or even in winter if you get tired of the same old, same old. Preheat oven (or toaster oven if you are me) to 450. Toss cauliflower that you have broken or cut into approximately 1 x 1 inch pieces with olive oil, salt and pepper and place it on a foil or parchment lined rimmed cookie sheet. Roast 20 minutes and watch it along the way. (I used my toaster oven, so if you are using a conventional oven keep checking-it could take longer). If it is pretty brown after 20 minutes, remove from oven and stir and then add in slivered garlic and continue roasting another five minutes until tender and golden brown. 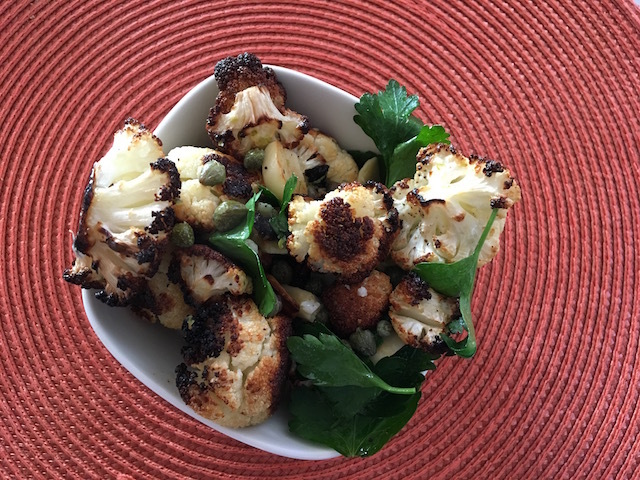 Take it out of the oven, scrape the cauliflower into a serving bowl and combine with the lime juice and zest, capers, and parsley or cilantro leaves. Serve warm or room temperature. It should make enough to feed four people but PSSSSST…. I have been known to eat this entire batch single handedly. Don’t judge. I love this. This entry was posted in Vegetables and tagged capers, Cauliflower, Lime. Bookmark the permalink.